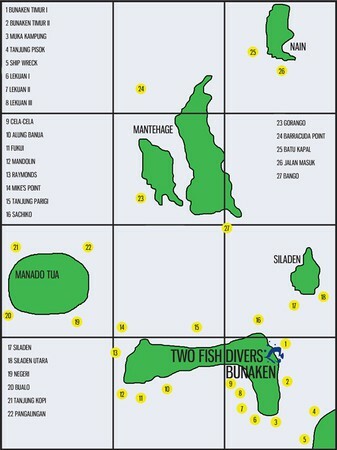 Below are just a small selection of what diving in Bunaken area has to offer. With more than 30 dive sites you will be spoilt for choice! The eastern side of Bunaken offers superb wall diving and excellent snorkeling. The vertical wall has many cracks and caves covered with corals, gorgonians and huge sponges. Fishes are abundant and you can expect to see many variations of butterflyfishes, surgeonfishes, parrotfishes, wrasses and anemonefishes. Possible encounters include turtles, white or blacktip reef sharks and stingrays. We have also discovered a few shark caves on this side of the island that some juvenile whitetip reef sharks call home, making this a special area for us. Bunaken, Timur lies on the east coast of Bunaken Island, the same side as Two Fish Divers’ resort. Sachiko’s Point is nearby at the north east corner. Both are typical Bunaken wall dives featuring a wealth of marine life. The video features napoleon wrasse, a spotted eagle ray, nudibranchs, a school of striped bonito, banded boxer shrimps, striped eel catfish, a whitemouth moray eel, a banded sea snake, a blackspotted pufferfish, and fairy basslets. The tops of the walls are covered in spectacular hard corals. The southern side of the island has beautiful coral slopes in a deep calm bay, as well as vertical winding walls on the sides of the bay. This side of the island has a high diversity of coral, fish and sponges, there are also many amazing snorkeling spots. The Lekuan dives are frequently rated as the best in the park, and they certainly helped make Bunaken famous. There are huge schools of fusiliers, pyramid butterflyfishes, bannerfishes and damselfishes. In fact on some dives there is just so much fish that you cannot see the reef wall. Frequently you will also bump into reef sharks, napoleon wrasses, hawksbill or green turtles, great barracudas, eagle rays, snappers, scorpionfishes and leaf fishes. Invertebrates include a variety of differently shaped hard corals, black corals, gorgonians, giant barrel sponges, nudibranchs and giant clams. Lekuan I and II are classic wall dives on the south side of Bunaken Island. Several large green turtles (Chelonia mydas) sleep on ledges on the walls here. Diagonal-banded sweetlips and pelagics like mackerel tuna pass by in the blue. We also meet a clown triggerfish, a bluefaced angelfish being shadowed by a trumpetfish, a lemon damsel, a whitespotted boxfish, a doublebar goatfish and pink anemonefish. A common lionfish hovers over the hard corals in the shallows. The dive sites on the western and northern sides of Bunaken consist of vertical walls abundant with reef fishes, lobsters, whip corals and giant gorgonians. You might also see large emperors, red snappers, groupers, dogtooth tuna, eagle rays, giant trevally, whitetip reef sharks, turtles and barracudas. Even manta rays and whalesharks are said to have been seen around Bunaken. The dive sites around Manado, Tua have steep vertical winding walls with many cracks, canyons and small caves. You can enjoy beautiful hard and soft corals, reef fishes, turtles and reef sharks. Our favourite site here is Pangalingan there is often a strong current and a large school of barracuda and bat fish at 20m. There is a large reef flat rising to about 5m where there are frequently huge schools of snappers and fusiliers, sometimes white-tip reef shark, and many small creatures such as leaf fish, ribbon eels and nudibranchs. Manado Tua, meaning ‘old Manado’ is a dormant volcanic island lying north of Bunaken. The video opens with the swim-throughs at Alung Banua on Bunaken Island itself and footage from Mandolin. We then visit Negeri and Bualo on the southern coast of Manado Tua where we meet nudbranchs, an anemone shrimp, leaf scorpionfish, damselfish, along with different species of anemonefish, a red fire goby and a Christmas tree worm. Off mainland is a site called Tanjung Pisok, it is a ten minute boat ride from our resort. It has a reef flat sloping to about 20 meters and is very rich with large tabular sponges, reef fishes, nudibranchs, ribbon eels and unusual green tree corals. We have also found a colony of pygmy seahorses which are a favourite for macro-photographers. The village of Tiwoho lies on the Sulawesi mainland just outside Manado and is a short ride by boat from Bunaken Island. The reef in front of the village makes an excellent dive site featuring some interesting small critters. This video features a school of striped eel catfish, a juvenile ribbon eel, juvenile sweetlips, nudibranchs, a horned starfish, a juvenile ribbon eel, a juvenile sweetlips, orange anemonefish, striped shrimpfish and an ornate ghost pipefish as well as spectacular hard corals in the shallows. There are only a few sites on the west coast of the island, our favourite is Barracuda Point. You can expect to see huge schools of up to 200 great barracudas, large schools of giant and big-eye trevally or bumphead parrotfishes. The large sand slope is also a favourite of dogtooth tuna and eagle rays. Currents can be a bit unpredictable so it is only advisable for the experienced diver. The island is surrounded by huge fields of hard corals; it has an amazing diversity of invertebrate fauna, big fishes and deep canyons. One of our favourite sites is Batu Kapal, a natural canyon formation which starts at 40m and goes down to about 70m, making it only suitable for advanced divers – why not take an Advance Diver course [link to course]. Hammerheads have also been spotted here, although there has been damage to the corals by dynamite fishing. Half way to Manado off the coast of the mainland there is a 75m long cargo shipwreck that lies at a 24-40 meters. The wreck is covered with colourful soft corals and it is a perfect hiding place for numerous schools of fishes, as well as scorpionfish, leaffish, nudibranchs and flat worms. There is a gentle slope from the ship wreck up to the reef top, and at about 10m you can find many coral heads and black sand full of fascinating small critters such as ghostpipefish, nudibranchs and pipefishes which are not found anywhere else on earth. The Molas shipwreck was a Dutch cargo vessel sunk during WWII near Molas beach, just outside the town of Manado. The deepest part of the wreck lies in 40m water. A school of longfin batfish circles the top of the wreck. At nearby Tanjung Pisok, also on the Sulawesi mainland, we meet orangutan crabs and a delightful tiny clown frogfish (Antennarius maculatus). We are also exploring other sites around Manado Bay for macro-photographers, discovering many unusual nudibranchs, pipefish, and octopus along our way. The southern side of Siladen Island has a vertical wall in large steps. The reef top is spectacular with a huge variety of hard and soft corals, and is excellent for snorkeling. The colours of the corals here are out of this world, it is always amazing to find up to 10 different coloured feather stars attached to a single large sponge. The eastern side has a reef flat at 10-15m with gravel and massive corals. Dive amongst reef fish, moray eels, ribbon eels, anemonefishes, and mantis shrimp. The gravel bottom makes this is a real ‘critter’ site!